The winning jockey, seen behind, is leaving to weigh in. 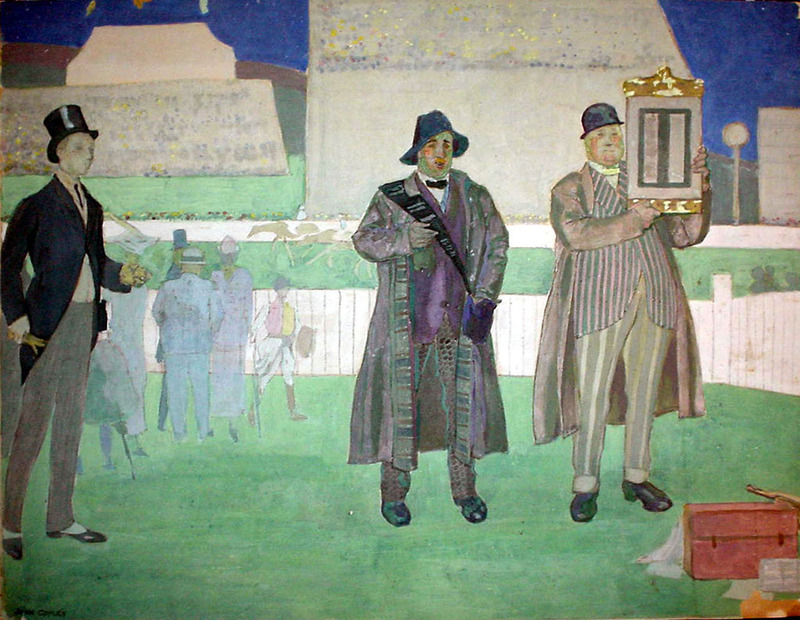 The bookmaker is about to shout ‘Pay Pay’ whilst his clerk holds the odds-board, and a morning-suited gambler stands by. John Copley was born on 25 June 1875 at his parents' home, Fallowfield, in Manchester, the only child of William Crawford Williamson (1816–1895), professor of botany at Manchester University and founder of palaeobotany, and his second wife, Annie Copley Heaton (1840?–1929?). Copley was always his working name but was formalized by deed poll only in 1927. He was educated at Manchester grammar school, Manchester School of Art (he saw Ford Madox Brown paint the town hall frescoes), and the Royal Academy Schools in London (1892–7). He then spent three years in Italy. His first lithographs were published in 1906. In 1910 he helped Joseph Pennell set up the Senefelder Club for the revival of lithography as a creative medium, and was its secretary from 1911 to 1915. Here he met his wife, Ethel Léontine Gabain (1883–1950), also a lithographer. They married on 28 June 1913 and had two sons: Peter (b. 1915) and Christopher (1918–1940). Copley produced 252 lithographs between 1909 and 1938 drawn on stone; almost all were in black and white and all were printed by him in editions of twenty to thirty. In perception, technical skill, and imaginative power Copley became perhaps the outstanding lithographer of the first half of the twentieth century in England. 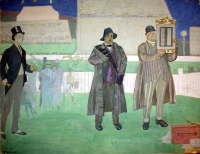 After his early complex colour works failed to sell, he found that black and white lithography was the ideal medium to record the activity of humankind, which he saw sometimes with sardonic humour, for example in A Lavatory (1909), sometimes with social concern, as in Recruits (1915). He loved the backstage life of the theatre, which he recorded in Footlights (1911), and delighted in the odd moment glimpsed: Seen from an Omnibus (1931). ‘He had the photographer's ability to freeze an action and hold it in perpetual potentiality’ (Taylor, 4). In 1930 he received the chief award and medal at the first International Exhibition of Lithography at the Art Institute of Chicago. Copley throughout his life was semi-invalid with a heart condition: for two years, 1925–7, he and his family lived in Italy for his health, at Alassio. Lithographic stones not being available, he turned there to copper plates, and from 1930, when working a lithographic press became too strenuous, he concentrated on etching and resumed painting. Between 1927 and 1950 he made 131 etchings, and the process affected his art profoundly. Instead of following the precise technique that had become characteristic of British etching he used bold expressive outlines and decorative hatching. As the painterliness of lithography was replaced by the precision of etching so his mental attitudes became both more introspective and also more daring; there was a blackish humour and an existential unease in his enquiries into the human condition. In 1939 war broke out and his wife became seriously ill, and in 1940 his younger son died tragically: subsequently his images seemed to grow in power and foreboding, as in Figures in the Wind (1940) and London Snow (1940). A series made in the Scottish highlands explored the fierce darkness and sudden light of mountain storms, of which Cairngorms (1943) and Loch Morlich: after Rain (1943) are memorable examples. One of his last etchings, In my Studio (1949), is a self-portrait in which he looks at his aged self with penetrating curiosity. All his prints were signed in pencil ‘John Copley’, sometimes with the addition of ‘imp.’, meaning printed by him: he had his own press and did all his own printing. Between 1910 and 1918 he often placed by the signature a printed drawing of a yew tree, thus identifying that it was made at Yews, the house he lived in during those years and which had fine yew trees in the garden. In 1998 the lithographic prints mentioned above sold at between £2500 and £3500, while the etchings fetched between £1000 and £2000. Other prints sold at between £250 and £700. Copley earned his living solely as an artist, making paintings as well as prints. In 1938 his paintings were exhibited jointly with those of his wife at the Colnaghi Galleries. He held no rigid political or religious views. In 1935 he participated in the Artists' International Exhibition against War and Fascism. In the 1945 general election, in an uncharacteristic moment of dogmatic certainty, he voted Communist.In his last years Copley found a rare new energy: besides working and caring lovingly for his increasingly ill wife, he was, in 1948, elected president of the Royal Society of British Artists, a conservative body shaken into life by his wide-ranging exhibitions which he invited film stars—notably Vivien Leigh—to open. He organized exhibitions for foreign artists (a de Chirico show electrified London), concerts, and picture-hire schemes. More especially, he arranged open assemblies for young contemporaries and students, and many then young artists benefited from, and also acknowledged, Copley's influence on their work, particularly Carel Weight, Paul Hogarth, Michael Ayrton, and Patrick Heron. Copley was a highly competent painter in watercolour, though his work in this medium is relatively rare.